With two small boys in my house I don’t get a lot of time to myself. Between getting my big guy off to school, preschool for my little one, tons of school events, after-school activities, and sports, we have a full calendar! Most mornings I’m up at 5:15 in order to get my husband off to work and my oldest on the bus. So I don’t get to take long lingering showers in the morning, but I do relish the few minutes of alone time I get with those morning showers, and now my entire showering experience has been taken to a whole new pampering level thanks to Aroma Sense. 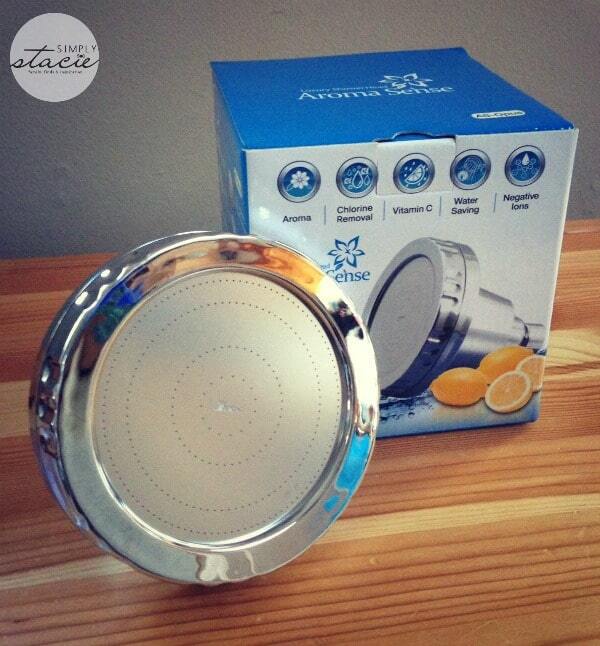 Aroma Sense sent me their wall-mount Vitamin C Shower Head for review, the flagship product of their line. This shower head is designed to fit any standard wall-mount bathroom shower head fixture. 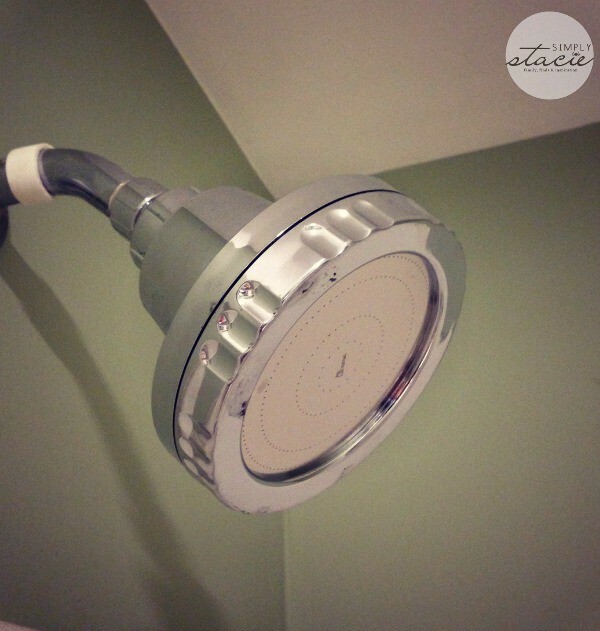 Installing it is an absolute breeze – I simply unscrewed our old shower head and screwed on this one. This shower head features over 100 spray plate holes and helps reduce water consumption up to 25% (a big cost-saving plus for me!). The Aroma and Vitamin C filter in the shower head use aromatic natural oils to revitalize the mind and body while promoting healthier skin and hair as it neutralizes chlorine (removing up to 98%!). Its micro fabric filter removes contaminants, rust, and floating particles, giving you a nice “clean” shower and it adds 421,000 negative ions/cc. This shower head also raises water pressure up to 1.5x more than the normal shower head. I absolutely love this shower head. I love the lemon scent it emits and how the smell lingers post-shower. 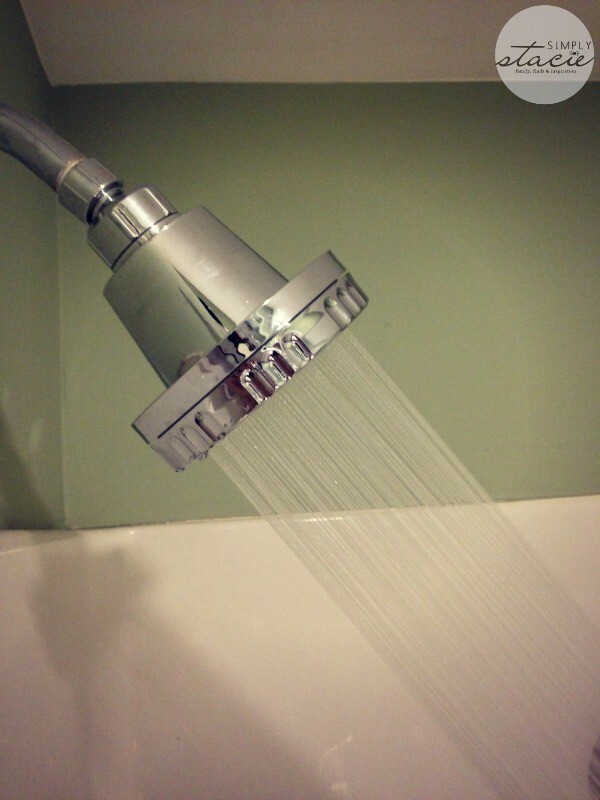 The pressure of the water is really very energizing and comforting, and both my husband and I agree that our hair and skin feel so fantastic since using this shower head – so soft and so clean. I can really notice a difference for the better since installing this piece. Using this shower head really is like having a mini spa experience in your own home. It’s amazing how something you probably don’t really give a second thought to during the course of your day can really change the rest of your day – a great shower experience is a wonderful way to start the day, and this shower head really delivers just that. The Vitamin C Wall Mount Shower Head sells for $79.99 on the Aroma Sense site. There’s also a hand-held version of this shower head, and you can buy replacement cartridges and filters on their site as well. This shower head would make a great unique holiday gift for the special people in your life who could use a little pampering – especially those notoriously hard to buy for people like parents and grandparents. Aroma Sense is a company that understands how a great shower can really transform your day and your life. Their premier technology is meant to deliver wonderful health benefits while creating a luxurious experience in something so simple, yet so important, as a shower. You can learn more about Aroma Sense by visiting their website and their blog. You can also find them on Facebook and Twitter. I’d like to try the eucalyptus filters in the shower head. I like the Aroma Sense Vitamin C Shower Head AS-OPUS (Wall Fix). It just happens we need one of these, and this is a REALLY nice one. i would like to try the Eucalyptus filler. I want tot ry the Aroma Sense Vitamin C Water Saver Shower Head (Large Handheld). I would love the Aroma Sense Vitamin C Water Saver Shower Head (Large Handheld). I would love to try the Aroma Sense Vitamin C Shower Head AS-OPUS (Wall Fix). Thanks so much for the chance to win it. This is such a neat idea, I like the Aroma Sense Vitamin C large handheld. I like the large hand held shower head. We would like to try the Aroma Sense Vitamin C Shower Filter-Eucalyptus (3 in 1 Handheld). I want to try the eucalyptus filters from their site. AS-9000 (Medium Handheld) + Variety Vitamin C Filter Pack.